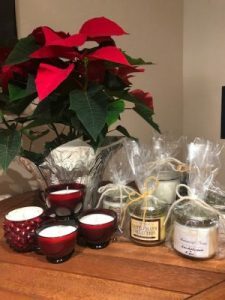 Stop by the Warehouse and indulge your senses with delicious wine inspired body products and candles by Botanical Notes, while enjoying your favorite Carr wines. The Riverside is a band of friends that became family. Southern California is the place that found them and, rather on a whim, unexpectedly started a life together on the road. 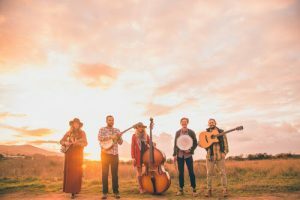 On that road, the band has developed a love for playing on street corners in the round with their vocal harmonies, and a classic lineup of folk-rooted stringed instruments. As friends, finding the beauty that traveling the country together holds, and speaking honestly about what they believe music is about (creating family), that's exactly what they've become. bryan TITUS is a rootsy, gutsy American singer/songwriter. Backed by a cookin’ band, bryan delivers a unique blend of rock ‘n roll, gospel, country, blues & bluegrass all stewing in the same pot. The music highlights the strong characters, iconic images and universal stories of American life. bryan TITUS leads a hard working band that puts it down in the studio and backs it up on the stage. 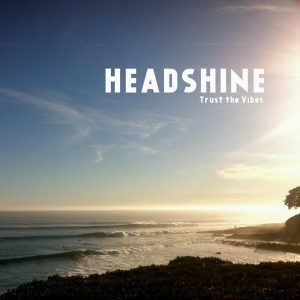 With a touch of California sunshine, the Huntington Beach singer/songwriter has cultivated a surfer/acoustic sounds called Headshine; and its what happened when something comes alive inside and begins to radiate. One moment you're singing along and the next thins you know you're at a show rockin' a shaker, or crowd surfing with a bunch of good friends. Listen to music and your head will shine. 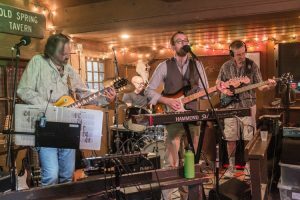 Based out of Santa Barbara, hailing from Philly to Scandinavia to Venezuela to Raleigh, Sleeping Dogs is a blues-rock band with influence from '60s rock to '70s guitar classics. The group entertains audiences from local bars to private party stages, and gigs range from the central coast through southern California. We invite Passport holders to join us for complimentary wine tastings, a sneak peek at harvest happenings, and exclusive special offers from Red Hen Cannery at the Warehouse, this Sunday October 1, from 12pm - 4pm. 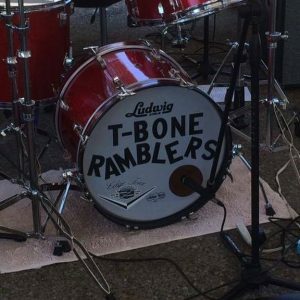 T-Bone Ramblers have been a staple in the Santa Ynez Valley music scene for decades... Band members are Bob Shelley, Mark Sanchez, Chris Jacobsen and Jeff Sgobba....Stay tuned for upcoming events and venue dates ... best classic rock. We will be closing the Santa Ynez Warehouse at 4:30pm this evening for a private event. Sorry for any inconvenience. 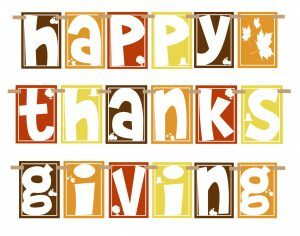 We will be closed on Thanksgiving Day. Make sure to stop in by Wednesday to load up on wine for the holiday! 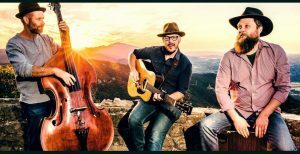 Join us for the Vintners Festival After Party at the Carr Warehouse in Santa Ynez, with live music by the T-Bone Ramblers! 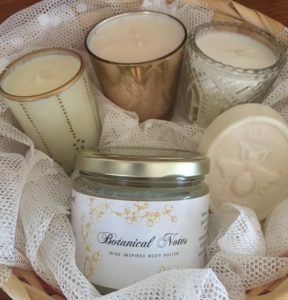 Join us for a fun day in Santa Ynez on Saturday, May 12th from 12pm-3pm. 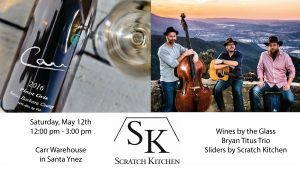 We'll be serving our new spring releases paired with sliders by Scratch Kitchen and live music by the Bryan Titus Trio! The Carr Warehouse will be closed on Wednesday, May 23rd. Sorry for any inconvenience. 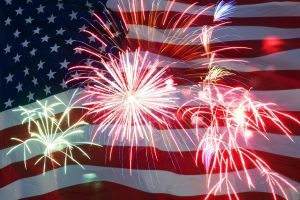 We will be closed for the 4th of July holiday. Sorry for any inconvenience. 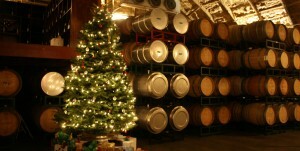 Carr Winery in Santa Barbara and Carr Warehouse in Santa Ynez will be closed on Christmas Eve & Christmas Day. Make sure to come in before and stock up on wine for your holiday celebrations! We will be closed on New Year's Day. 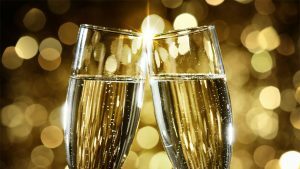 Make sure to stop in New Year's Eve before 6pm to load up on wine for the holiday! 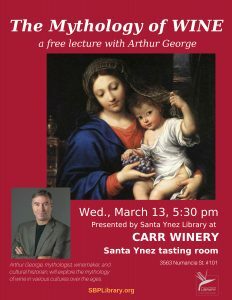 Carr Winery is teaming up with the Santa Ynez Library and Arthur George for an educational, free lecture on the mythology of wine. Enjoy wines by the glass while listening to Arthur George (mythologist, cultural historian, and winemaker) explore the mythology of wine in various cultures over the ages. The event is taking place at the Carr Winery tasting room in Santa Ynez. Carr Winery has various parties throughout the year in The Barrel Room and at The Warehouse including art shows, live music, winemaker dinners and release parties. We also participate in many offsite events and tastings across the United States. The Barrel Room & The Warehouse are available for private parties. Carr Winery is an elegant setting for your corporate event, birthday, rehearsal dinner, anniversary or other private event.